Now I’ll be honest: while I love all things makeup, skincare and bodycare, one area that I had neglected most is probably my hair. 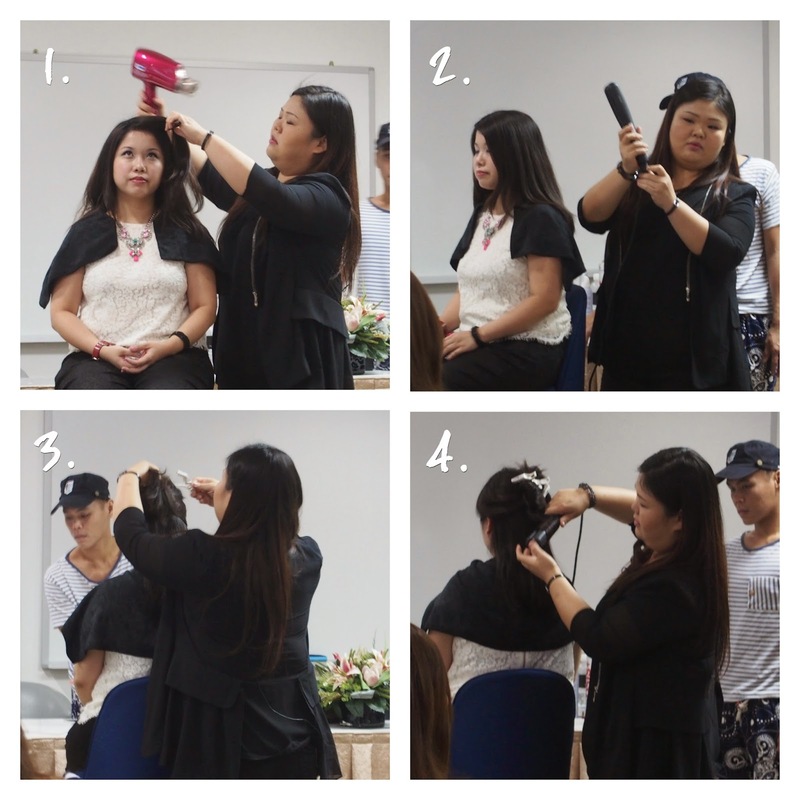 So you can imagine my slight panic when I found out that we were to be using hair-styling tools as part of our Best Beauty Blog judging. 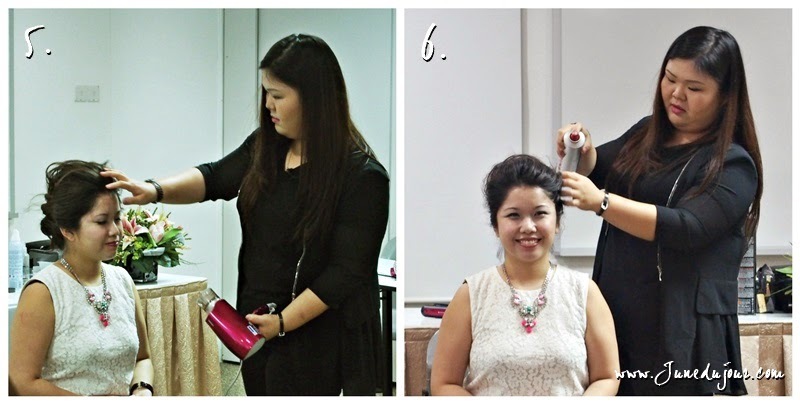 Thankfully, we were invited for a professional hair workshop organized by OMY.sg and Panasonic, hosted by long-time hair maestro Hong Ling (who worked with several prestigious local magazines). Each of us blogger and their guests were armed with battle weapons...oops, I mean hair tools which consisted of: the nanoe™ Flat Iron (EH-HS95-K), and the EH-NA45 Nanocare hairdryer and EH-SE60 eletric eyelash curler. My two sidekicks of the day, Germaine and Angela were psyched, as we will be having a hands-on with the tools to recreate the looks. Now I know you are thinking what I'm thinking: Curls for that all important boardroom meeting? Sounds almost like a paradox in itself, considering how curly hair has been long thought of unprofessional and not-as-put together as straight hair. But as Hong Ling shows, its all in how you work the hair tongs! 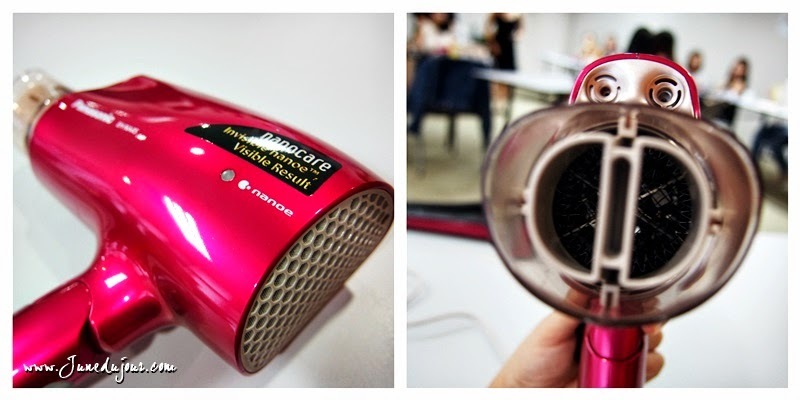 Step 1: Using the Nanocare hair dryer and a normal comb; run the comb down section by section of your hair, whilst pointing the hair dryer nozzle down along with it.Tip: try not to wash your hair directly before styling; since your hair produces natural oils which help your style last longer. But if you really need to, try doing it the night before you curl your hair. 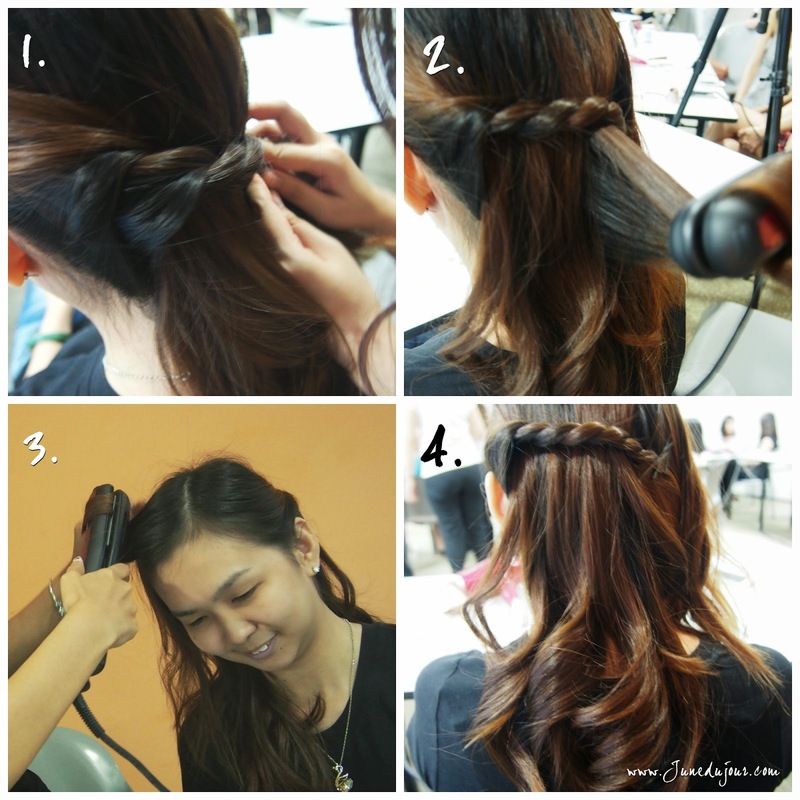 Step 2: Ideally, the hair iron is held about 3 to 5 away from the scalp to avoid nasty burns on your head. Here we set the temperature at 180C but I personally recommend heating it to the lowest temperature first so as not to burn your hair (if its fine and thin). Step 3: Rule of thumb is to always start from the bottom. Leave down as much hair as you can work with for your first "layer" of curls, and pin up the rest. Once that layer is done, unclip your hair and let down another layer. Step 4: Clamp the straightener between a section on hair and turn it inwards on itself (half turn). Move the iron slowly down the hair strands towards the end. Do note that the slower the hot iron moves, the curl becomes tighter. When the hair is clamped, grab the remaining hair that isn't clamped and wrap it around the hair straightener once. The hair should be pulled under the flat iron, not over the top of the flat iron. OK, seems easy enough... lets have a go at it! We did get off to a rather rough start. Fumbling fingers aside, we consulted the expert and she gave some quick tips on handling the tricky flat iron. I shall not be defeated!!! Tres Chic! I absolutely loved this look: its simple, fuss-free and probably the most easily achievable hairstyle that one can duplicate with curly or straight hair. Adds abit of interest for a girl's day out or score extra style point on that first date. Step 1: Grab an amount of hair from the left side, and seperate it into 2 portions. Twist it around each other until you get a braid-like result, then drape it across to the right side just under the ear, and secure it with bobby pins. Step 2: As shown in the first look, simply repeat the hair curling process with the hair iron, covering all areas to give a full, feminine curly locks. Do vary the curl direction to give a more natural, slightly ruffled look. Step 3: Coming to the fringe, using the hair straightener to curl the hair the usual way, One mistake I made was curling it the same direction, causing it to bunch into one fat curly piece. Step 4: Pull all of your hair over your shoulder (the opposite side to your side part) and finish with a spritz of and set it with hairspray. Voila, it was completed before you know it! After having some warm up with the first look, we clocked this hairstyle in under about 15 minutes. AND of course, Michele model of the day who couldn't miss the chance for a selfie while Hong Ling finished her hairdo! Right back to business was the last and most challenging of them all: the Gala Dinner look. Think big hair, elegant updo to wear for those posh end of year dinners and fancy soirées. Step 1: Segregate your hair into 2 parts, and pin it up with the a clip so as to hold in place while working from the bottom. Step 2 +3: Step 2 +3: Divide the bottom layer of remaining hair into 2 parts, and tie one side up into a bun.Tease it into a looser bun and securing it with bobby pins, and then taking the other side of the hair portion and pinning it loosely around into a bun as well. Step 4: Let down the top section of the clipped hair. This essentially becomes a 'cape' effect to cover up the pinnings of the bottom layer. 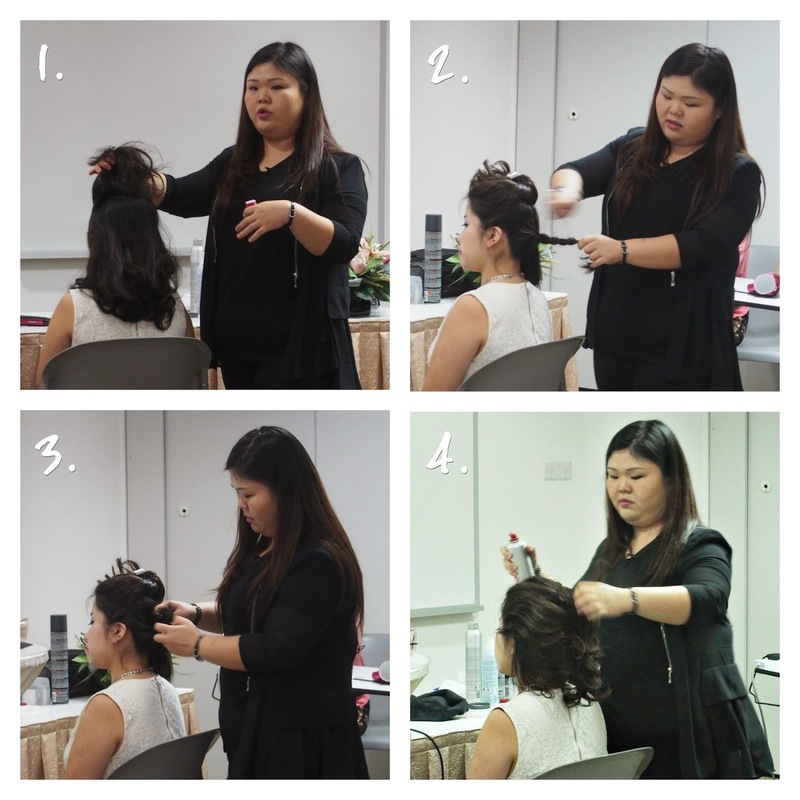 Step 5:Keep the front sleek with some pouf to give that regal look; Hong Ling here uses the hairdryer to give some volume and sweep all stray strand back before pinning them back and hair-spraying to keep it in place. Step 6: Tuck the hair neatly around this faux-bun created from the bottom layer, and secure it with pins. The curls peeping from hair's ends give it an extra dimension from your usual sleek chignons. When done, set and hold the hair with hairspray and you are ready to rock that gown and killer heels! Not forgetting of course my friendly competitors, us top 10 finalist in the Best Beauty category.